Nursing students brought their healing touch to people living in the hills of El Salvador during spring break. 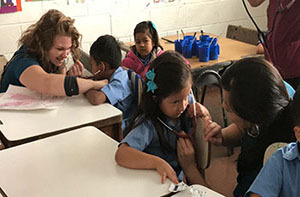 A team of 11 nursing students traveled with Assistant Professor of Nursing Dr. Bri Andrassy and her husband Robbie ’14 to Lake Coatepeque to offer medical care to the Salvadoran people. They were joined by nursing alumna Dustin Magdales ’15, who is also in the DNP program. In six years, 128 students have participated in the medical missions trip to El Salvador, Andrassy said. The nursing students work in partnership with King’s Castle Ministries. They helped with triage and pharmacy at a clinic on the ministry’s campus and went house-to-house in the mountains assessing physical, mental and spiritual needs. “It’s mind, body, spirit,” Andrassy said. “The people as a whole, they’re very, very open. We get to pray with each family. The team took a cattle truck to the homes in the mountains that are a 2 ½ to 4-hour walk from where they stayed. High blood pressure, diabetes, wounds, gastrointestinal issues, dehydration and the common cold were among the most frequent ailments they saw, said Andrassy ’14/’16 MSN/’17 DNP. The people who live on a mountain get their water from the rain. With this being the dry season, some of them were drinking only half a cup of water a day. The future nurses gave away over-the-counter medicines and educated people about why they’re feeling how they’re feeling, Andrassy said. They gave culturally-appropriate tips for how to treat common conditions with limited resources. For example, eating fruit with a high water content can help if they’re getting headaches from dehydration but don’t have access to more fluids. Nursing students also might tell patients with respiratory issues to cover their mouths with a cloth when they’re cooking to avoid exposure to smoke, recognizing that they’re not going to rearrange their kitchen to ventilate it. Students learn about giving culturally-relevant education in their classes, but they do it firsthand in El Salvador. The trip gives them a global perspective on healthcare. Ten years ago, the clinic was a dream of the doctor who runs it. A few years ago, the ministry broke ground, and two years ago, nursing students started volunteering at the completed clinic. Some of the students go back to volunteer on their summer breaks. Last year, a few students on the team met a woman who was taking care of her grandson who couldn’t walk or talk and who suffered from a host of disabilities. Back at home, leveraging social media, they raised enough money in three days to supply the 5-year-old boy with a walker, an adaptive stroller, food and diapers. Andrassy delivered the supplies last summer. This year, they returned with two walkers that pull the boy from behind. Photo top: Future nurses treat children in El Salvador, 2019. Photo bottom: A 5-year-old boy receives a new walker from PBA nurses, 2019. ← IT’S A 100 PERCENT ‘MATCH’ FOR FAU’S SOON-TO-BE PHYSICIANS!